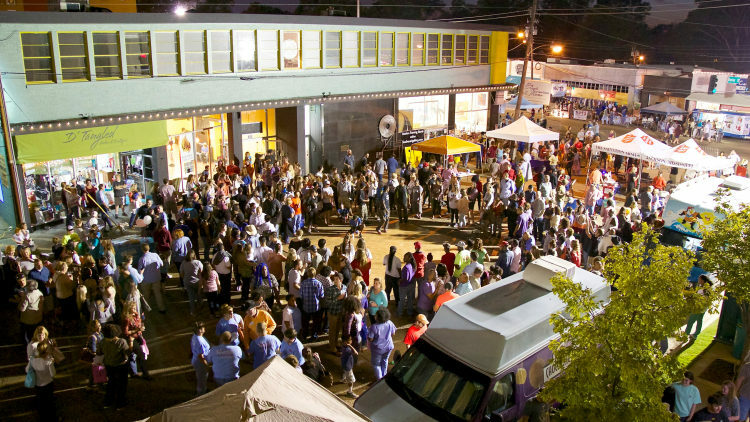 Fondren is Jackson’s crown jewel, reinventing itself – and the city – one person at a time. As the arts district of Jackson, Mississippi, Fondren is the hub of artistic expression through music and visual arts and boasts unique owner-operated boutiques and over two-dozen locally owned restaurants, bars, coffee shops and bakeries (see our directory of shops and dining). The history is an interesting one (read more here). Fondren was once known as ‘Sylum Heights as the home of the Mississippi Lunatic Asylum. This once suburb of Mississippi’s capital city was annexed by the city in 1925 but has maintained a character and charm. Locals own this place and the feel is small town, but with a hip and eclectic twist (check out photos from around the neighborhood.) The neighborhood is diverse, multicultural, open minded and accepting of all people. Each week, the neighborhood is a buzz with activities like concerts, art openings, group fitness opportunities, book signings, food tastings and more. Sign up for our email and never miss a thing! The area we call Fondren is from Woodrow Wilson Avenue to the south, Northside Drive to the north, the ICR Railroad line to the west and I-55 to the east (area map). Our downtown historic district was recently listed on the National Register of Historic Places by the National Park Service. Fondren is three miles from downtown Jackson is and is bordered by the LeFleur East and Greater Belhaven neighborhoods. Though many individuals and groups have been a part of the revitalization and renewal, the neighborhood has been preserved and greatly enhanced by Fondren Renaissance. • Produced by Creative Process, this video asks “What makes Fondren ‘Fondren’? • Produced by the Mississippi Development Authority, Mississippi Arts Commission and The Ramey Agency, this video showcases one of the state’s shining examples of the creative economy, Fondren.